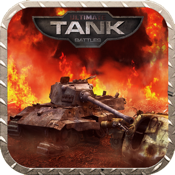 Ultimate Tank Battles is the latest in Tank Warfare games for the iPhone, iPod touch and for ipad. Unlike some of the other games in this genre, Ultimate Tank Battles is more action than strategy and it is easy to jump right in and start playing. The game is simple yet fun. There are 20 levels plus a training mission. The camera follows behind your tank. The goal of each level is to control every point on the battlefield by raising your flag at every flagpole. There are many flags in each level. Some start controlled by your team and some by the enemy team. When you're near an enemy flag, it'll begin to lower, and your own flag will eventually rise. Allies can also help put up your flags, but enemies can retake flags as well. You can blow up enemy tanks to stop them from raising their flags. Capture all the points to win! One of the features that stands out in this game is the controls. You can guide your tank with almost pinpoint accuracy by using a combination of the on-screen directional arrows (see the bottom left corner of the screen shot) and the accelerometer. This precision is critical when you are using the Light tank (fast and nimble but weak) and you need to 'hit and run' when directly fighting the enemy. Other tank classifications are Medium (well-balanced) and Heavy (powerful and tough but slow).